La Palestine, Iudee, Terre Promise ou Terre Sainte. 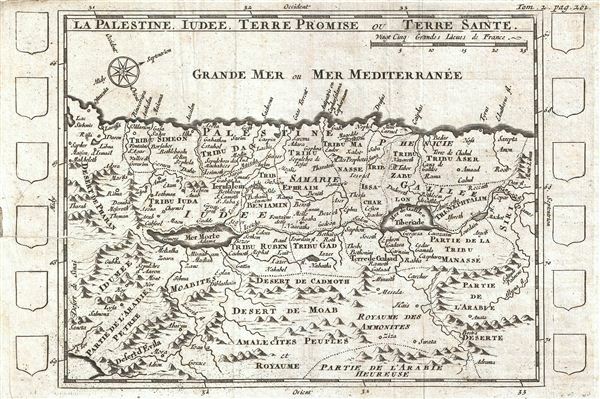 An uncommon c. 1700 map of Israel, Palestine, or the Holy Land. Centered on the Jordan River Valley, this map covers from the Mediterranean to the Biblical deserts of Moab and the Amalekites. Israel is divided according to the Biblical Tribes of Israel and their neighbors. The map identifies both factual and fictional locations including Jerusalem, Tyre, the Dead Sea, the Sea of Galilee or Lake Tiberius, and on the fictional side the ‘Desert of evil,' and other sites. The map is surrounded by twelve incomplete armorial crests, suggesting that the cartographer may have had plans for this map that did not, in the end, materialize. Prepared for Martineau du Plessis' Nouvelle Geographie, published in 1700. Very good. Closed verso repair extending approximatly 3 inch from left center margin. Original fold lines. Platemark visible. Blank on verso.